In this provocative account Tia DeNora reconceptualizes the notion of genius by placing the life and career of Ludwig van Beethoven in its social context. She explores the changing musical world of late eighteenth-century Vienna and follows the activities of the small circle of aristocratic patrons who paved the way for the composer's success. 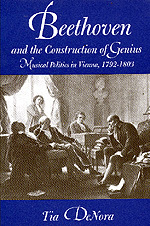 DeNora reconstructs the development of Beethoven's reputation as she recreates Vienna's robust musical scene through contemporary accounts, letters, magazines, and myths—a colorful picture of changing times. She explores the ways Beethoven was seen by his contemporaries and the image crafted by his supporters. Comparing Beethoven to contemporary rivals now largely forgotten, DeNora reveals a figure musically innovative and complex, as well as a keen self-promoter who adroitly managed his own celebrity. DeNora contends that the recognition Beethoven received was as much a social achievement as it was the result of his personal gifts. In contemplating the political and social implications of culture, DeNora casts many aspects of Beethoven's biography in a new and different light, enriching our understanding of his success as a performer and composer. Tia DeNora is Lecturer in the Department of Sociology at the University of Exeter.